2018 is here, and this spring MyFigueroa will be complete and open to the public! Construction continues to move full speed ahead, with lots of underground utility work taking place. Now that the installation of LADWP water meters for landscaping is complete, the four bus platforms on the northern stretch of Figueroa St (between Olympic and 8th streets) are being built. Concrete is currently being poured for the curb and gutters of these bus platforms, with guardrails and foundations to follow. The foundations for the other five southern bus platforms will also be poured in the next few weeks. 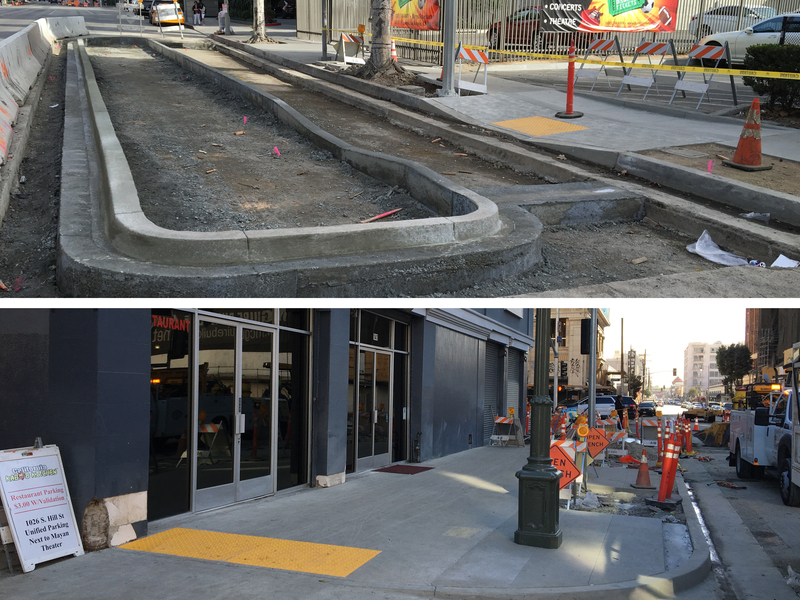 Progress is also being made on the north side of 11th St, with new, wider sidewalks and ADA-compliant curb ramps now installed for several blocks. The majority of the northern sidewalk will be complete this month, and then the north side of 11th St will be landscaped as construction shifts to the south side of the street. The MyFigueroa project recently topped the list of 'LA Moments to look forward to in 2018' on Curbed Los Angeles, and we are proud to say that crews will continue their work along Figueroa and 11th streets, as we move toward project completion by Spring 2018. We look forward to a ribbon-cutting with the entire community in the coming months!